Q: Does Vivid Reports CPM modify, change or write data back to the ERP / Accounting system? A: No. Our software doesn’t require you to change your ERP for Vivid Reports CPM to work. Vivid Reports CPM is a “read only” system in that ERP data only moves in one direction. 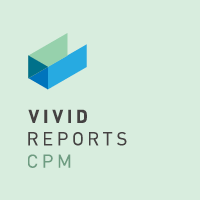 Q: How long does it take to install Vivid Reports CPM? A: It depends on the ERP you’re using, the number of companies you have and the features you need to enable (currency conversion, custom period definitions, etc.). Times can vary from one hour to four or more hours for the database and configuration. We charge a fixed fee for database installs so you always know how much this will cost up front. Clients can be installed in five minutes and, if you’re using terminal software, then you only have to install it once. Q: How long does it take to learn Vivid Reports CPM? A: That depends on how much functionality you need, how complex your reports are and how comfortable you are with learning new technology. Most of our customers have between four and eight hours of training for reporting and if budgeting is also being used then up to another eight hours. If needed, you can schedule follow-up sessions to add more skills and knowledge. Q: How does your licensing work? A: Vivid Reports is based on a Named User license model. This provides each user with their own set of functionality and a unique security profile. There are user types for consuming / viewing reports, performing advanced analysis, report building, and budgeting. Other licenses are required for the server side capabilities. Vivid Reports is not licensed per device or install and may be installed onto a terminal server. Q: How do you keep departmental reports out of the hands of the wrong department manager? A: Restrictions can be defined for each user or applied to a role. You may restrict your users so they can only access the companies, accounts and segments (or any combination thereof) to control what can be viewed at the Report Level, Account Level, Transaction Level and Budget Input Level. Restriction defined at the Transaction Level can be based on any field within the Vivid Reports CPM Transaction table. Q: Does Vivid Reports CPM support Unit or Statistical accounts? A: Yes. Our built-in currency conversion module can also convert different units of measure i.e. metric to standard. Q: Can Vivid Reports CPM completely replace FRx? A: Vivid Reports CPM is a complete replacement or alternative to Microsoft FRx and Management Reporter (MR) as well as Epicor AFR and other CPM solutions. You can continue to use FRx after Vivid Reports CPM has been installed. Q: Can FRx reports be converted to Vivid Reports CPM? A: Yes. Existing Excel reports and templates can also be converted to Vivid Reports CPM. Q: Does Vivid Reports CPM report on Dynamics GP’s analytical accounting? A: Yes. You can treat AA codes as segments and they become an extension of the account number. Q: What are the benefits of a Data Warehouse? Q: How does the Vivid Reports CPM database get updated and how long does this take? A: The Vivid Reports CPM database can be updated at any time directly from the Vivid Reports toolbar. The update is performed incrementally and will therefore only has to synchronize what has changed since the last update. The update takes under one minute for the majority of our customers. You can also control which user’s have the ability to update the database, schedule the database for updates (nightly or during the day) as well as who can see the status of the database. One of the key benefits of Vivid Reports is that you can generate reports, that reflect the latest information in your ERP, more quickly than going directly to the ERP. This is because the data is being optimized for reporting within our database. Q: Can Vivid Reports CPM be deployed with Citrix or Terminal Services? A: Yes. This is a common and efficient method of deployment. Q: Can Vivid Reports CPM accommodate eliminating entries for inter-company transactions? A: Yes. The recommended best practice is to define a company or department within the ERP where the eliminations can be entered. The eliminations are then combined with the legal entities to complete the consolidation. Eliminations can also be handled in Vivid Reports CPM through a table in Excel or through a special budget that stores the eliminations but can still be combined with Actuals from the ERP. Q: Do you need a license to view a report created in Vivid Reports? A: No. Vivid Reports are 100% normal Excel files. Anybody with an Excel license can open and view reports created in Vivid Reports. A license is only required when you need Vivid Reports functionality such as dynamically refreshing a report, using the control panel or performing analysis using one of the integrated tools. Vivid Reports budget templates can also be distributed to non-Vivid Reports users for manual input. You also have an option to distribute reports in both Excel or PDF formats. Q: How can I be sure that I’m not missing accounts on a report when I add new ones? A: Vivid Reports CPM has a Report Check feature that will check for missing accounts and segments on a report as well as range overlaps (duplicate accounts). There are various ways to identify new accounts and segments along with the date they were added to your ERP. Vivid Reports CPM also provides some advanced options to see which accounts and segments are included and where, and an ability to automatically generate new rows and update the reports in Excel with a couple of clicks. New accounts created are automatically captured based on the report definitions when those definitions are based on ranges or wild cards. Q: Does Vivid Reports CPM have its own currency conversion? A: Yes. Vivid Reports CPM supports multiple currencies and currency conversion, even to currencies not defined or used by the ERP. Q: How do you generate, distribute or print departmental statements? A: We have a very secure and proprietary way of integrating with Excel. We treat Excel like a browser for your financial reports and information. Reports and analysis generate very quickly and this allows the users to select what they want to view or analyze. We also have an automation tool (available at no extra charge) that allows users to distribute reports to other users or recipients, printers (PDF), folders, Sharepoint or email. Reports can be opened by anyone with or without a Vivid Reports CPM license. Vivid Reports CPM licensed users can also drill-down into those same reports. Q: Can you generate P&Ls by department on a separate page for each department or do you have to change the departmental filter to refresh a single page? A: You have a few options for this. You can have a single Excel worksheet with a Vivid Reports CPM Control Panel that allows a user to quickly change the department view, you can also link multiple worksheets together that are driven off each other or a “parameter” worksheet. Automation can be used to build a set of workbooks with a worksheet for each department all from one master report layout. Q: What does “ERP” stand for? A: ERP stands for Enterprise Resource Planning such as Microsoft Dynamics GP (Great Plains), Epicor, SAP or Peoplesoft. Vivid Reports CPM integrates with your ERP to provide enhanced reporting and CPM (Corporate Performance Management), which also includes analysis and budgeting.